In simplest terms, the zodiac is a collection of patterns formed by lines that connect twelve groups of the brighter stars in the night sky as they become visible over the course of a year. Among the earliest to chart these patterns were the Babylonians. During the first part of the first millennium BC they noticed is that it took about 360 days for any star to return to the same location it was first observed. Consequently it took the same number of days for their overall chart of the stars to repeat itself. This discovery led to the development of a 360 day calendar that was divided into into twelve equal segments of 30 days each. Each of the twelve segments on the chart were then given names that would become known among astronomers and astrologers as the constellations of the zodiac. With the exception of Scorpio ( formerly The Eagle ), the Latin names of the signs of the zodiac as we know them today are still translations of the old Babylonian constellations. Over time, socio-political pressures moulded the 12 segments of the astronomical calendar into civil calendars, the most common of which is the Gregorian calendar in common use today. However astronomers preserved their 360 day star chart and it evolved into a celestial coordinate system whereby each demarcation point in the 360 day cycle became 1 degree along the path in the sky traced by the apparent movement of the Sun through the 12 constellations. This path, known as the ecliptic also encompasses the circular plane delineated by the Earth's orbit around the sun. This relationship is also the foundation for the geometry of a circle and the design of the protractor and compass. 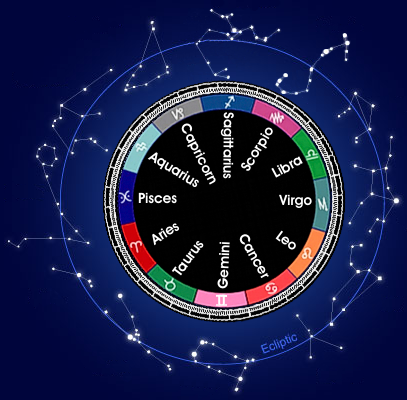 The signs of the zodiac are also an integral part of astrology, the earliest forms of which were very useful for predicting seasonal changes and their associated activities. For example, in the regions where the constellations were first mapped, the seasons were not the same as those in temperate zones. There was no freezing winter or spring thaw. However constellations rising early in the year would herald the time for planting ( earth ), while those rising later in the year would predict the coming of summer ( fire ) followed by the rainy season ( water ) and the windy season ( air ). Over time these symbols became associated with more esoteric pursuits including alchemy and magic. Similarly, the complex relationships between astronomical constellations and Earthly affairs attracted the attention of fortune tellers who fused it with their practice, thereby turning astrology into the pseudoscience we know today. In ufology, the zodiac is best used as a learning tool to introduce skywatchers to the science of astronomy. Contrary to skeptical opinion, any serious ufologist will have at least an introductory knowledge of astronomy. Some are backyard astronomers, and a few more, like the late J. Allen Hynek may even have professional credentials. Having a basic understanding of astronomy can be very useful for discerning natural astronomical phenomena from UFOs. It can also be used for describing the position of objects ( including UFOs ) when observed in the night sky. It also doesn't hurt to know that when someone is talking about the Pleiadians, they are referring to what some believe are a race of aliens from a star cluster located in the constellation of Taurus. Ufologists are not concerned with the zodiac in any astrological context, unless perhaps, it is to review their daily horoscope.